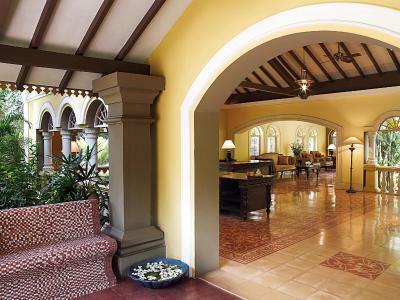 Lock in a great price for Taj Holiday Village Resort & Spa, Goa – rated 8.8 by recent guests! STAFF SERVICE (specially NIDHI) & CARE for guests & there Needs. extremely beautiful & artistic landscaping. hospitality was of high Standards. very courteous staff members. Breakfast spread worth mentioning. Great location. Right on the beach with easy access. Large property with lots of trees and a quiet relaxing ambiance. The rooms are kept clean. Service at the pool was not bad. They do take the extra effort to control the mosquitoes. The airport shuttle service is a good touch. The friendly vibe and a request for a tree cutting,fulfilled!! Everything ... Probably the best Property in Goa in terms of Location , ambience & facilities . Taj Holiday Village Resort & Spa, Goa This rating is a reflection of how the property compares to the industry standard when it comes to price, facilities and services available. It's based on a self-evaluation by the property. Use this rating to help choose your stay! 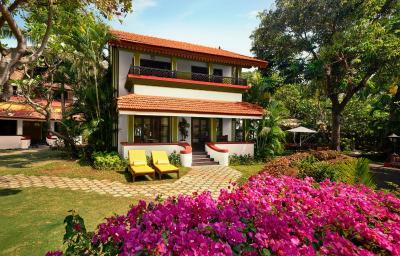 One of our top picks in Candolim.Taj Holiday Village Resort & Spa, Goa is a beachfront property offering terracotta-roofed cottages spread across 28 acres of beautifully landscaped gardens. It features a large outdoor pool with a sunken bar, a day spa and daily buffet breakfast. Complimentary airport transfer by shared air-conditioned coach is provided. A stroll from the sandy beachfront, air-conditioned cottages come with a choice of sit-outs with scenic landscape or sea views. They have a 32-inch flat-screen TV, DVD player and seating area. Offering stunning sea views and cool breezes, Goan specialties and fresh seafood dishes can be enjoyed at The Beach House’s outdoor dining area. There is also a Thai restaurant and pool bar. 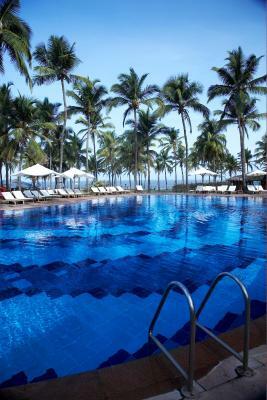 Located on Sinquerim Beach, Taj Holiday Village Resort & Spa, Goa is a 75-minute drive from Goa International Airport. Free parking is available. This property also has one of the top-rated locations in Candolim! Guests are happier about it compared to other properties in the area. 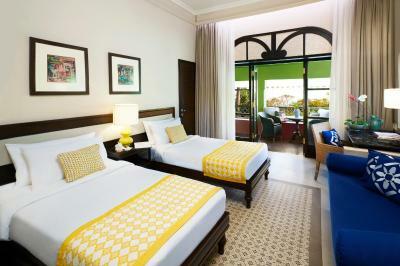 When would you like to stay at Taj Holiday Village Resort & Spa, Goa? Features a spacious balcony opening out to views of beautiful garden landscapes. Complimentary airport transfer by shared air-conditioned coach. Free WiFi for 4 devices. Opens out to scenic views of landscaped gardens. Opening out to sea views, most units come with a private lawn area, hammock and deck chairs. Opens out to scenic garden views and offers outdoor seating. Offering added privacy and outdoor seating, this sea-facing cottages opens out to stunning ocean views. This is a cottage with a king bed. It has garden view and a private sit-out. The private bathroom comes with a bathtub. Overlooking a garden, this cottage comes with a twin bed and an attached bathroom with bathtub. Offering a sunset view, this villa has one bedroom. The private bathroom comes with a bathtub. This double room has a bathrobe, sofa and DVD player. This villa features a sofa, mini-bar and air conditioning. 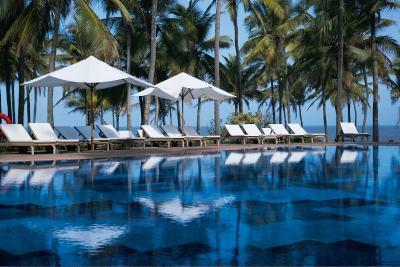 Vivanta by Taj - Holiday Village, Goa stretches languidly on the pristine sands of Sinquerim beach and fringes on the more popular beaches of Baga and Calangute. 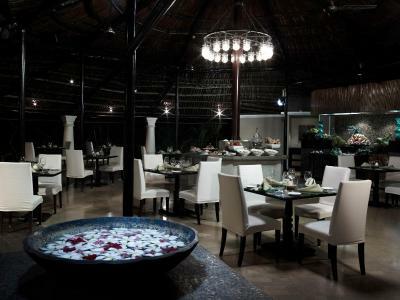 The perfect place to experience old world Goa with a modern twist. Guests can choose from an eclectic range of Portuguese-Goan cottages and villas or The Luxury Bliss Villa Sunset View for some extra pampering. House Rules Taj Holiday Village Resort & Spa, Goa takes special requests – add in the next step! Taj Holiday Village Resort &amp; Spa, Goa accepts these cards and reserves the right to temporarily hold an amount prior to arrival. Taj Holiday Village Resort & Spa, Goa accepts these cards and reserves the right to temporarily hold an amount prior to arrival. Please note that for security purpose all Indian guests are required to present a valid photo ID proof (Voter's ID, Driving License, Aadhar Card, any other ID with address approved by the Government of India. Pan Card is not acceptable). All international guests are required to present a valid passport and visa. For Indian guests, cash settlements of INR 25000 and above will require a pan card copy during check out. Please note that for the Full Board Package any child between the age of 5 to 12 years (both years included), will be charged at an additional cost and needs to be cleared at the time of check in. 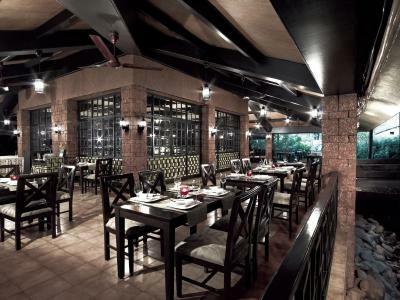 Please note that guest card will be charged INR 1 immediately after the reservation is made for validation. Please note that extra person and child rates may vary as per meal plan inclusions and special offers. Kindly check the same with the hotel. Please note that as per income tax rules, every person shall quote his/her PAN while making payment to hotels and restaurants against their bills for an amount exceeding INR 50000 at any one time. Amazing hospitality and a super kid friendly place! Excellent location, nothing like Taj Hospitality !! Charged extra payment for the child and adults . The Thai restaurant is amazing! And the breakfast included is too. The staff were incredibly helpful and I had a very early flight and they arranged transfer for me at 3am. Would 100% go there again! It’s the perfect getaway. Breakfast was very bad service . No lights in the property to walk to the villa especially with 80year old father and 4 yr old child. 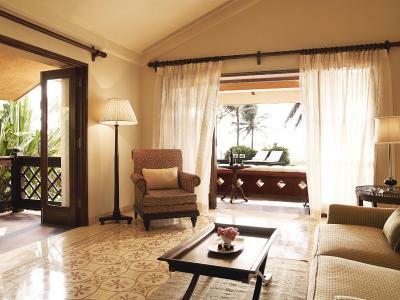 Taj at goa was one of the best experiences we’ve had from a hospitality point of view. The hotel staff from managers to housekeeping were super attentive, friendly and extremely gracious. Will want to mention names and thank them personally. Hitesh, Anamika, Jaiprakash, A heartfelt thank you for taking such good care of us, right from pick up to drop off. Beach is not private it is public , few sun bed. I couldnt use any sunbed even around of pool. I couldnt use swimming pool and beach. Staff,esspecially reception staffs were very helpful and kind.